A Piper Afloat - Attachment to HMS Cottesmore by Piper Ringland. I and Ranger Groves, a bugler from 1 R IRISH, joined HRH The Duke of York’s ship HMS Cottesmore, a minesweeper, on Tuesday 10 May 1993. We had a very warm welcome from everyone on board. We met The Duke on Wednesday morning when we were invited to his cabin and welcomed aboard. He also wished us an enjoyable time over the next month. Later that morning we set sail for London, for a formal visit from HM The Queen. We arrived in the Thames on Thursday morning. I played the pipes on the bridge roof from the Thames flood barrier to Canary Wharf, where the ship docked. The rest of the morning was taken up preparing the ship for HM The Queen’s visit, which took place later that day. 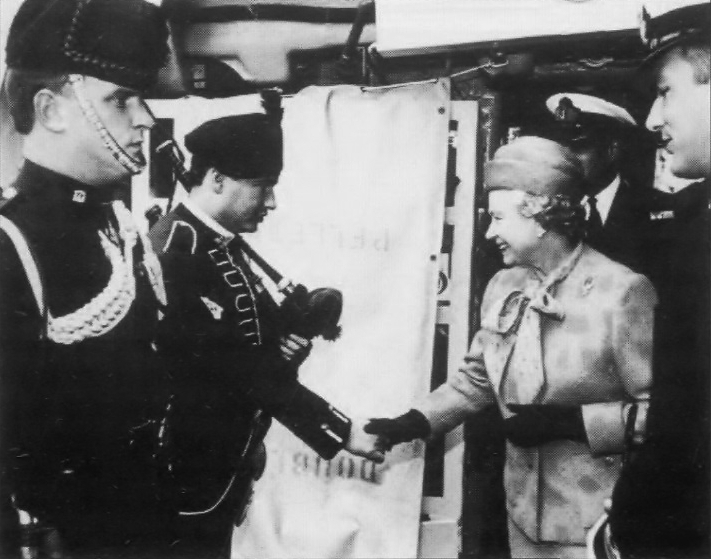 The ship’s company was placed at certain parts of the ship to meet and be presented to The Queen. We met her on the sweep deck [the aftmost deck on a minesweeper], set close to the waterline at the rear of the ship. At the end of her visit I piped Her Majesty ashore. That evening The Duke brought HRH The Duchess of York on board to meet the ship’s company. Later I piped at a cocktail party. We stayed in London until Tuesday 17 May, and then once again we set sail back to Portsmouth where we stayed until Friday 3 June. During our stay, Portsmouth base held Navy Days, (a lot like one of our open days only bigger, but not wetter!). Portsmouth naval base was opened so the general public could come and have a look at the ships in the docks, both inside and out. I did some piping on Cottesmore during this time to try and attract the crowds. Believe it or not, it worked! We also did some work on the ship, including sanding and varnishing, an agreeable way to pass the time. On Friday 3 June we left Portsmouth for Caen in France. We didn’t take part in the D-Day celebrations, for our purpose in going was to take The Duke over. While we were in Caen, we docked alongside the Royal Yacht, Britannia. We had a visit from Prince Charles, Princess Anne, The Duke of Gloucester and a couple of Admirals. I had to pipe the Royal party off the ship. When leaving France we passed by the Royal Yacht. The Queen and Princess Margaret were standing at the side. When they spotted me standing in No 1 Dress they called for me to play for them. The Duke told me to play the Regimental March Killaloe, saying 'Her Majesty likes that tune'! He later told me she was very moved by the piping. We left France on Monday 6 June and arrived at Rosyth in Scotland on Thursday. On the way the ship was tasked to search for an RAF Tornado which had crashed in the sea. After finding a couple of large rocks by sonar, the ship found the wreckage. Once we got into Rosyth the Duke drove us to Edinburgh Airport and we flew from there to Heathrow. I was then taken from there to the Duke’s house “Sunninghill Park” and stayed there from Thursday to Saturday 11 June. While I was there I did some piping around the Duke’s gardens. I was also shown around Windsor Castle and other parts of Windsor Park by the Duke’s butler. On Saturday morning I flew along with the Duke and his staff from RAF Benson to RAF Aldergrove on board The Queen’s Flight. It had been one of the most memorable experiences of my life, and I enjoyed myself very much.